This is my absolute favorite meal. 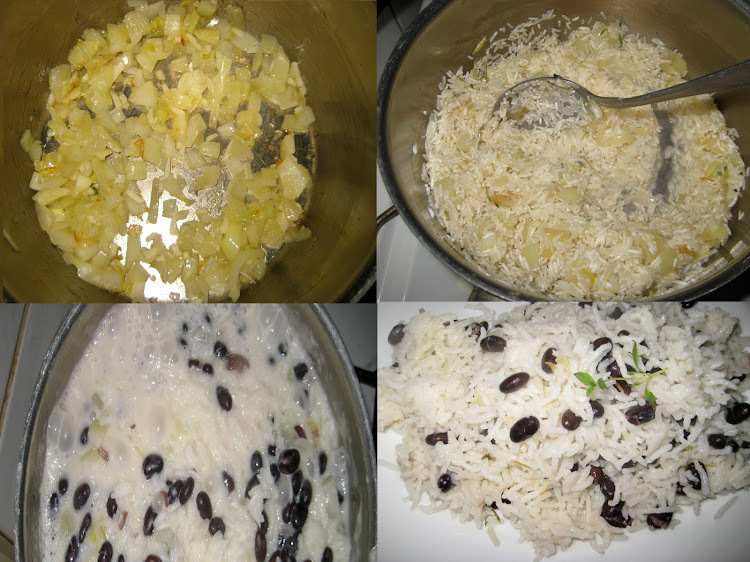 I discovered it in early 2011 while I was watching Nigella Kitchen, where she showed how to make a jerk sauce and coconut rice with pigeon peas. Although Nigella used chicken, I had the bright idea to make it with tofu. 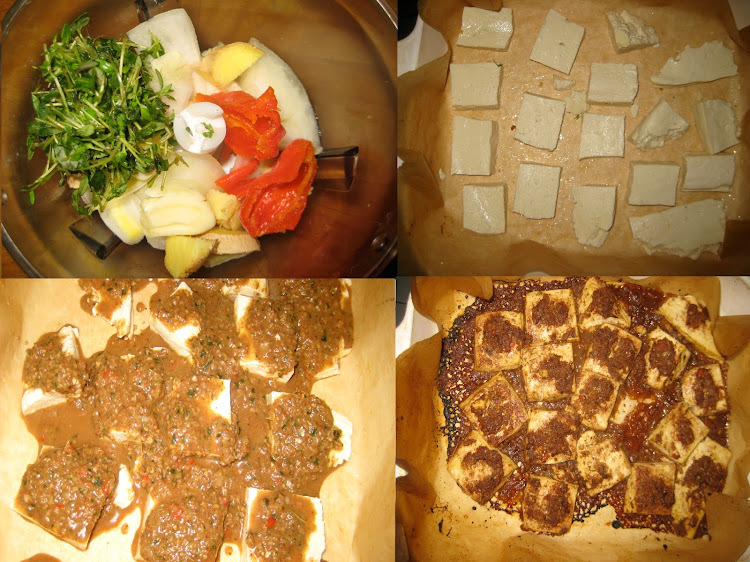 And since I marinated it for hours, it tasted nothing like tofu and was filled with flavor and chewiness. To me, this is revolutionary. In some way, it also reminds me of tandoori paneer, because that charr is present in both the paneer and this tofu, and it's irresistible. Habanero chillies, or its close relative the Scotch Bonnet, are one of the hottest chillies out there. They are also extremely flavorful and are a vital component to the jerk sauce. You can reduce the amount of chilies, and also de-seed it to reduce its potency. Please do wear gloves or even a plastic bag on your hands while you are de-seeding these peppers. 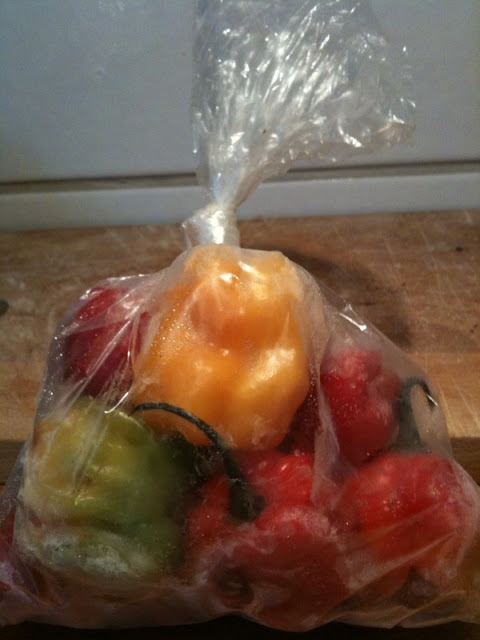 These peppers freeze easily wrapped in a plastic bag for later use. Tofu gains a chewy texture after being in the freezer, so that is the way I always handle it: Open a package of tofu, weigh it down to release some of its liquid, wrap it and freeze for 8 hours. I then thaw it in the microwave and squeeze out as much of its liquid as I can, and then it takes in the marinade quite willingly, provided it's marinated for long enough. You can read more about my tofu preparation here. 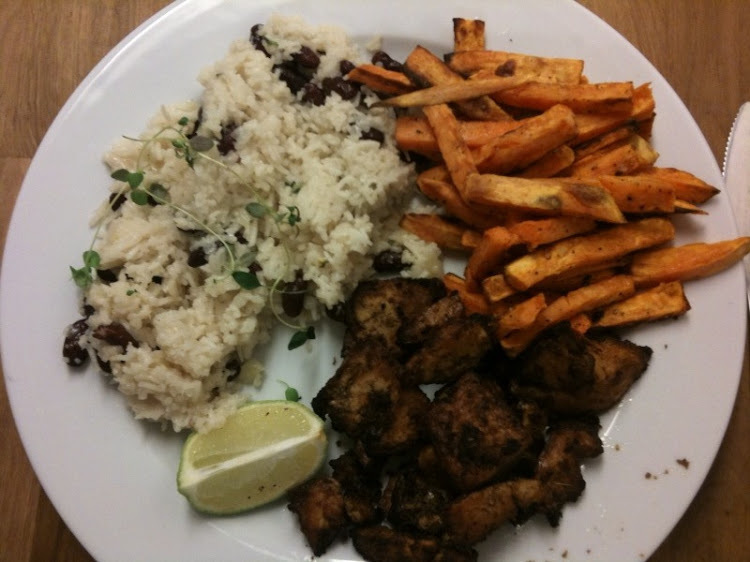 We enjoy this dish with Jamaican beer (Red Stripe) and music. I also like to serve it with a side of roasted sweet potatoes or pan-fried plantains. Tip: Make double the batch of marinade and freeze for later use! 1. In a food processor, add all the ingredients except for the tofu and grind to a smooth sauce. Taste for salt. 2. In a sealable container, pour the sauce over and under the tofu and allow to marinate for about 3 - 4 hours. 3. Preheat the oven to 220C/425F. Grease a casserole dish or pan with canola oil. Line the tofu evenly in one layer along with all the marinade. Allow to cook 20 - 30 minutes, until a crust ensues. 1. Heat oil in a heavy bottom pan and add onion. Cook until golden, then add garlic and cook for a minute. Saute the rice and bouillon with the onion for 2-3 minutes, stirring most of the time. Add coconut milk, water and the scotch bonnet pepper. Add just a pinch of salt since the bouillon will be salty, or sprinkle some salt after the rice is cooked. 2. Bring the rice to a boil on medium heat. Once the boiling bubbles create tunnels in the rice, stir in the beans and reduce the heat to low, cover with a tight lid and cook for 10 minutes. Turn off heat and allow to rest for 5 - 10 minutes before eating. Enjoy warm, perhaps with sweet potato fries to extinguish the burn! Squeeze some lime juice over the whole meal as the acid balances the heat. Oh my god, I just made this with chicken, and it was fiery and soooo delicious! Our mouths were burning, but we couldn't stop eating. I recommend making this with tofu, it's really special how the flavors seep into it, and since I use defrosted tofu, it's so chewy! You would never miss the meat. This looks awesome, I'm trying to go vegetarian and I think this recipe will certainly help! Thank you Elena! I do hope you try out this recipe, perhaps you'll become as addicted to it as I am! I mean, I have to eat this spicy tangy meal once a week, that's how much I love it! Hi Zan, glad to hear you enjoyed the recipe! It is a forever favorite of mine! Other than a side of green beans and sweet potatoes, it goes well with steamed broccoli too! Or sauteed spinach or kale! Recipes look great! Do you use sweetened or unsweetened coconut milk for the rice? Hi Mandy, thanks! I always use unsweetened coconut milk and actually now prefer to buy it in a tetra pack instead of canned because of the BPA risk in canned foods. That jerk tofu looks good. Vegans in Jamaica prepare it. You should try jerk breadfruit as well.